The Puzzle Page: Knot or Not? One day Professor Egghead was taking a walk in the park behind his house and spied a cord of some sort lying on the path. From the distance that he was from the rope he couldn't see if it was knotted or not. As he continued to approach the cord he wondered about the probability of the cord being a knot. 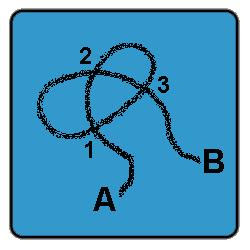 In what orientations would the cord be a knot and what is the probability that the cord was knotted? The answer its not. Here is how you work it out. Solution: The ropes/laces or not knotted because you can see that its just one over another so when you pull both ends it will come out straight with not a knot found on the rope/lace.